WALTHAM, MA - November 5, 2009 - Steinway Musical Instruments, Inc. (NYSE: LVB), one of the world's leading manufacturers of musical instruments, today announced that it has signed an agreement with Samick Musical Instruments Co., Ltd. for a private placement of 1.7 million shares of its ordinary common stock at a price of $16 per share, approximately 37% above the closing market price on October 28, 2009, the date the parties set the purchase price. Steinway intends to use the proceeds of approximately $27 million to retire outstanding debt and for general corporate purposes. Samick was also granted the right to purchase by March 31, 2010 an additional 1.7 million shares of ordinary common stock at an exercise price of $16 per share. Piano Forums Piano Cruise - It's Going to be Fun - Join Us! Our first Piano Lover's Cruise is coming up fast. Join us for the fun. My thanks to the members who have sent me sheet music for the "Sheet Music Wall of Fame". The project is still going, please consider donating some old sheet music. There are a few new Piano Parties coming up soon. This one is still in the early planning stages, if you're in the area please join the discussion. The Piano Performance Group in Bend Oregon will have a Christmas Party- Piano Party on Tuesday December 1st, 7.00 P.M.
World renowned concert artist Jeffrey Biegel Reaches Out to Students via Skype! A distinguished Professor of Piano at Brooklyn College in New York, and protege of the legendary teacher, Adele Marcus at The Juilliard School, Mr. Biegel now offers online interactive lessons for pianists and teachers alike. Preparing for a recital or concerto appearance? Want to improve your playing to teach your students? Questions about specific repertoire you are learning, teaching or performing? Jeffrey Biegel has opened his studio worldwide through the technology of the internet. Having created and performed the first live audio/video concerts on the internet in 1997, Mr. Biegel is now able teach on a global level. Need to brush up on your technical abilities? Need assistance in putting programs together, and audition materials? You can benefit from the life and career of Jeffrey Biegel. This is not one of those canned video presentation, this is Live, Interactive, Online Lessons! 10 Pianos Out In the Street! That's right, 10 pianos all outside ... where anyone can play them! And what fun it is hunting them all down. 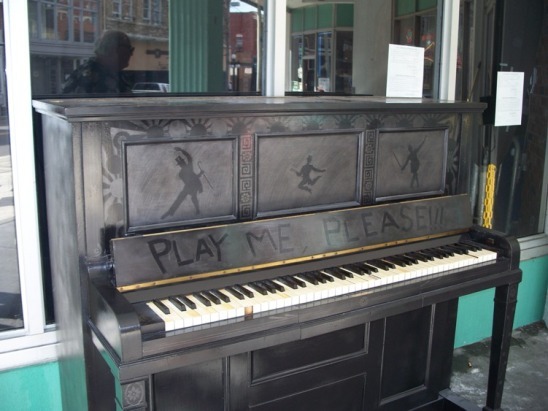 Ten different pianos in ten different spots around the city. Each one of them painted by a different artist. Read the thread, view the pictures, and join the hunt! "For a non-pianist, the idea of a microtonally fluid piano might seem either no big deal or baffling. But this weekend a composer will reveal the result of a 10-year mission – nothing less than the re-invention of one of the most important instruments in western music." Can Piano Make Exercise Fun? Apparently this has been discussed before, but I really like the video, so I'm sharing it with you now. The countdown continues. Now it's only about 7 weeks until the big show. January 14-17, 2010. Let us know if you are planning on attending, or exhibiting. And by all means, let me know if you'd like to meet up while we're out there. Longtime member and piano aficionado BoseEric has created a wonderful thread full of great pictures and comments about his recent tours of some highly respected piano manufacturers shops in Europe. Although Eric works for a particular highly respected piano company, the thread is his personal observations and opinions based on his love for all well made instruments. His comments are a fun and interesting read but it's the pictures that make you wish you were there. Eric has promised us more pictures and comments in the near future, can't wait. We hope to put together a tour of the great European piano factories in 2011. Ideally we'd like to tour the factories, and visit the birthplaces of some the worlds best known composers. Side trips might include theatres, museums, and castles. In fact, we'd love to rent a castle as the center of operations for the tour, with all of our group staying together in the castle. We already have a standing invitation from Christian Blüthner (Blüthner), Udo Schmidt-Steingraeber (Steingraeber & Söhne), and Indrek Laul (Estonia). Any other manufacturers who would like to host a tour of our group(s)? Please let me know. In the meantime, please join us for our Caribbean Piano Lovers Cruise. What better place to formulate our tour plans then sipping cocktails on the deck of a cruise ship? If you enjoy the Piano Forums, please consider doing a little something to help support them. We are a small business that relies on revenue from our advertisers and sale in our online store. We are surviving, but like most small businesses, money is tight. Please visit our Help Support the Forums page for some suggestions of how you might help. The first Chicago Amateur Piano Competition will be held next year from June 24 – June 27, 2010 (Thursday through Sunday). Applications are now being accepted from amateur pianists who pursue piano playing through love of the instrument and its repertoire, rather than as a professional occupation or for financial benefit. Competitors are expected to be at least 30 years of age at the time of the competition, and may be neither a faculty member at a music school nor a student pursuing a degree in piano performance. SAN ANGELO, Texas — A 23-year-old Russian pianist who is a student at Texas Christian University took the top prize over the weekend at the Sorantin Competition, wowing the judges with a performance of the Prokofiev Piano Concerto No. 2. Our own Jeffrey Biegel was one of the judges. *Save 10% on all products in our online store, now through Dec. 10, 2009. Simply enter "take10" (without the quotes) in the coupon box during checkout. Each month I try to pull together some information I hope our subscribers will find interesting, informative, or just plain entertaining. I'm happy to do it, but I'm only one person. There are over 31,000 subscribers to this newsletter, not to mention 46,000+ members of the forums. With over 1.2 million posts, it takes a lot to slog through looking for answers. Moving particularly helpful threads to one of our FAQ sections helps new visitors/members find answers, and minimizes the need to keep posting the same answers to the same questions over and over. Again, please Let Me Know if you think you've spotted a good canditate. And PLEASE, include a link directly to the post. Speaking of watching your actions on the forums, I will once again warn everyone... Stick to the facts when posting about a business or individual. Do not use the forums for your private vendetta. As the host, I am protected, you are not. Disgruntled former employees or unhappy customers be warned you can be held responsible for false and/or defamatory statements on a public forum. Stick strictly to the facts. 46,000+ Forums Members, Over 1.3 Million Posts, and still growing!